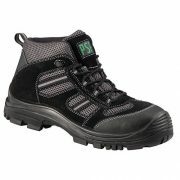 Description: Composite lightweight trainer meaning it is 100 metal free. 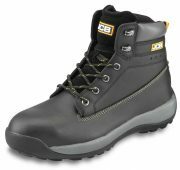 Features: Black water repellent leather shoe, textile lining, anti-shock, antistatic, slipping resistant, non metallic APT Plate midsole. Footwear completely free from metal parts. AIR footbed made of EVA and fabric, antistatic, anatomic, holed, antistatic. TPU toe cap protection. Outer Sole made from Antistatic Polyurethane / TPU directly injected in the upper TPU, 3 colours, slipping resistant, abrasion resistant and hydrocarbons resistant. Plus points Footwear completely free from metal parts. SOFT-BED GEL PLUS footbed, anatomic, made of scented PU, antibacterial, soft and comfortable. 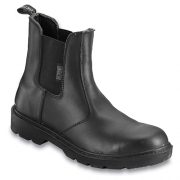 The wide gel insert in the heel area absorbs the shock impact. 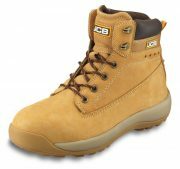 Outsole TPU 3 colours, resistant to flexions up to -25°C. 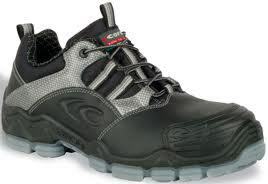 The special design of the outsole was studied to provide maximum foot support. TPU toe cap protection, resistant to scratches and abrasion.